I took advantage of the Home for the Holidays promotion at Safeway in which you spend $30 on participating products and receive $10 back in an in store coupon. 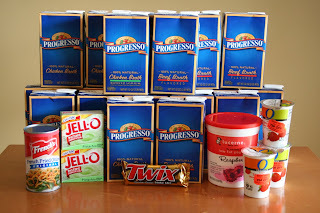 20 cartons of Progresso Chicken Broth, on sale in Portland BOGO, used $1 coupon from the 10/5 and the 11/15 inserts. I also bought 20 off the internet costing me $1.70. Used $15 in catalinas from last Albertsons promotion. I have been rolling my catalinas since my Glade moneymaker deal. Instead of spending my profit on treats like cereal or ice cream, I have been holding onto them until the next catalina producing promotion. That is pretty much the only way I can stockpile as my grocery budget is tiny. Sometimes the promotions don’t produce stockpiling items, but if they produce a high value catalina than I will do the deal so my catalina won’t expire. to sleep than I would be able to work on more deals in the Home for the Holidays Promotion. Hopefully those teeth will come through before the deal is done! Great job! I just came across your blog from “grocery gatherings”. I’m always looking for Portland coupon bloggers. Nice work! You totally earned the right to skip in public. So I chickened out and did my deal separate but I didn’t have any catalinas to roll either so it was way less out of pocket for me even though I could have gotten the $10 catalina. I still got 26 boxes of stock for $2.47. And I’m totally ok with that. Since it gave me a near heartattack to think of producing 20 coupons at once. I was just sure they would call the cops on me or something, ok well maybe not that. But question me about where I might have acquired 20 coupons!!! I’m not too quick on my feet verbally, so I know I would have stumbled all over the place with that one. Anyway, kudos on this great deal… This is what I am aspiring for. What a cute munchie too by the way. 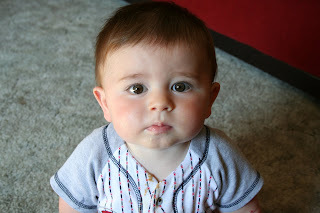 I just want to squeeze those little cheekies!